Gov. Charlie Baker, center, is flanked by Lt. 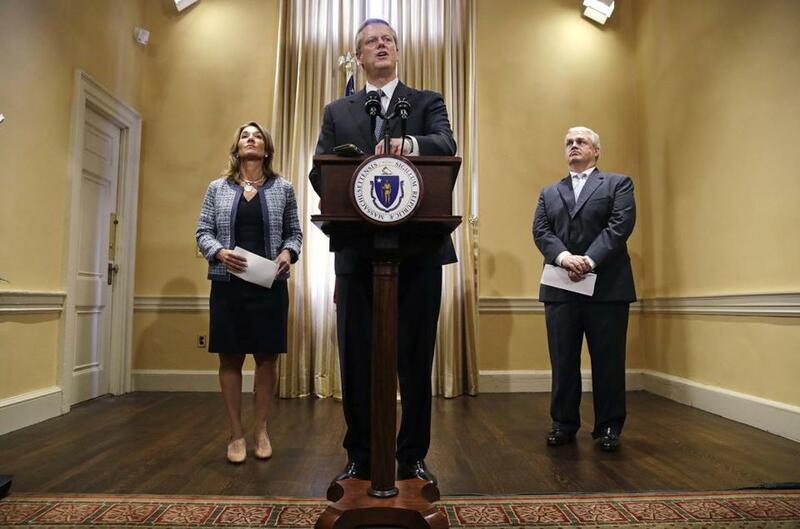 Governor Karyn Polito, left, and Secretary of Administration and Finance Michael Heffernan, right, as he addresses reporters after signing the 2019 budget at the Statehouse on Thursday. Governor Charlie Baker on Thursday all but nixed an effort to relieve the growing congestion around Boston by offering a discount on highway tolls to drivers who commute during off-peak hours. But in signing the spending plan Thursday, Baker sent the toll discount provision back to the Legislature with the suggestion to instead conduct a broader study of traffic congestion. “I think putting the pilot in place before you actually do the work to figure out what will solve, and work to improve, our issues with respect to congestion puts the cart before the horse,” Baker said Thursday. The rejection gives the Legislature only a few days to respond before formal sessions end July 31. Several cities around the world have used higher tolls to combat traffic and raise money for transportation projects, a strategy known as congestion pricing. London, for example, charges drivers about $15 if they enter the central part of the city during business hours. New York officials said earlier this year they would consider a similar program in Manhattan, though it has so far been limited to new charges for taxis and ride-hail trips such as Uber. The Massachusetts proposal was strictly limited to cutting tolls during off-peak periods, not raising them during rush hour. And that idea seemed to be more palatable to Massachusetts commuters. In a poll last winter, a majority of voters said they would support toll discounts — but not increases — as a way to manage traffic. In recent days, however, talk radio hosts and conservative newspaper columnists blasted the proposal as a stealth campaign to eventually raise tolls on rush-hour drivers. And in a radio interview last week, Baker said he was not convinced it would work: A small change in tolls, he argued, likely wouldn’t affect driver behavior, and nor does he support a larger difference in prices for commuters based on the time of day. Still, activists had hoped they could change his mind before Thursday. This week, the motorist group AAA and the Pioneer Institute, a right-leaning think tank where Baker once worked, each said they supported the proposal. Chris Dempsey, director of the nonprofit Transportation for Massachusetts, said lawmakers should still push for the discount, arguing the data from a pilot would be of use for Baker’s traffic study. “We think we have a traffic crisis in the Commonwealth, and the longer we wait to test innovative ideas, the longer Massachusetts will stay stuck in place,” he said. It’s not clear the measure has broad enough support in the Legislature to overcome Baker’s rejection. The office of House Speaker Robert DeLeo pointedly noted last week in the Boston Herald that the idea for the toll discount originated in the state Senate. Moreover, even if the Legislature restored the discount in the next few days, Baker could veto it, leaving lawmakers no time to bring it back before the formal Legislative session ends July 31. Neither of the two Democrats running to challenge Baker this fall have said they support congestion pricing, though they have both flirted with it. Jay Gonzalez, a budget director under former governor Deval Patrick, has said he would “actively explore congestion pricing.” Environmental activist Bob Massie, meanwhile, has said the concept is “worth exploring,” but worries it would unduly burden lower-income workers. Joshua Miller of the Globe staff contributed to this report. Adam Vaccaro can be reached at adam.vaccaro@globe.com. Follow him on Twitter at @adamtvaccaro.